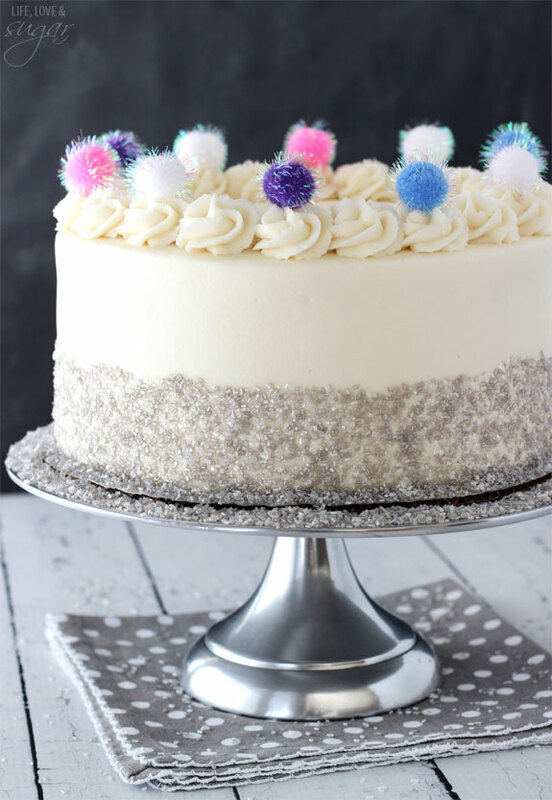 This Sparkly Pom Pom Cake is so fun and so easy to make! 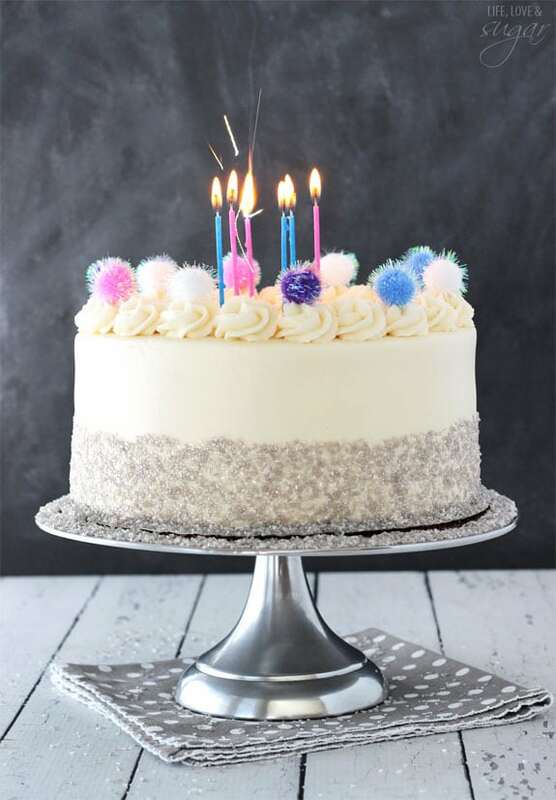 It makes a great celebration cake and would even be fun with various colors for different holidays. I’ve been really excited to share it with you. 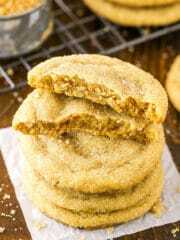 So today’s post is a little different because it doesn’t have a recipe in it. Crazy! But it is still all about the cake. So I guess you could say I’m going back to my roots a little with this one. But while those older ones are a little more involved with fondant and all, this cake is super easy to make. 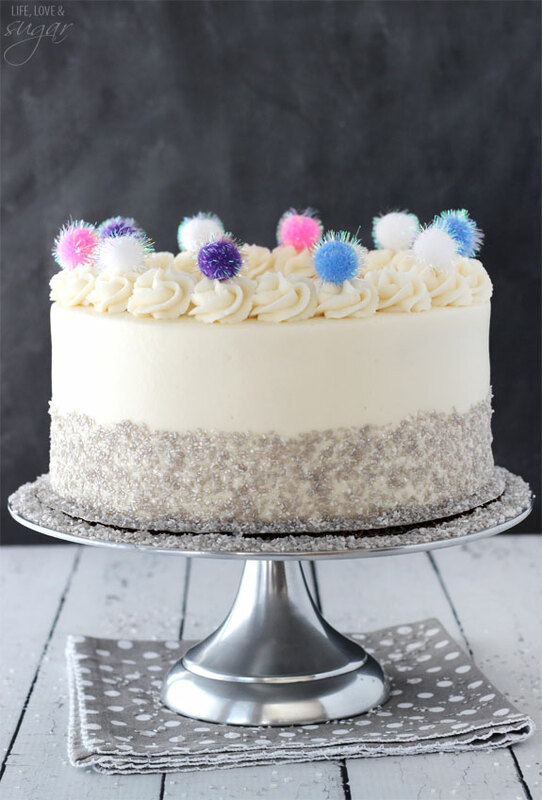 I bought these sparkly pom poms for a totally different reason and when I didn’t use them, they became the inspiration for this cake. I decided to use silver sprinkles to go with them and then top the cake with sparkler candles. Sparkle galore! 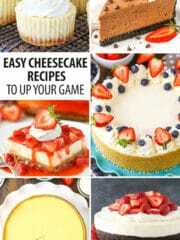 To start, you should have a cake of your choice baked. Then get your pom poms ready to go! 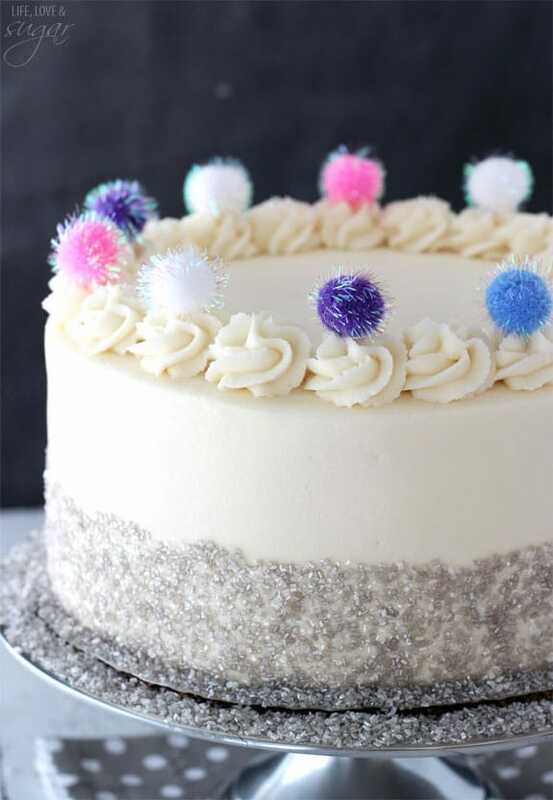 To add the sparkly pom poms to the cake, you’ll want to first glue them to toothpicks so that they will stick into the iced cake. I used my hot glue gun, but I also tested it with super glue and it worked well. For the hot glue, press a little glue onto a paper towel. 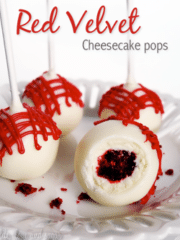 Then dip the toothpick into the glue and place a pom pom on top. 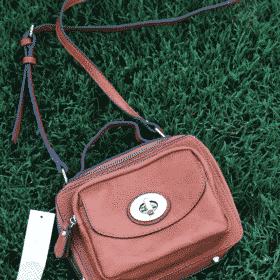 Hold it there for about 30 seconds, until it stays in place when you let go. 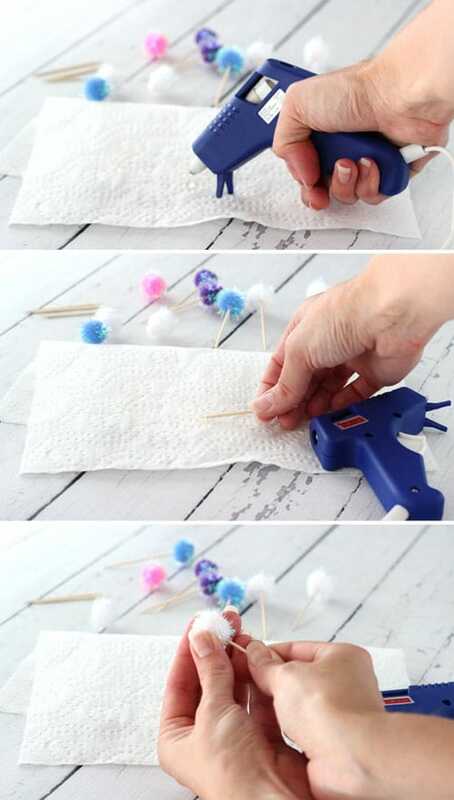 If using super glue, just squeeze a little onto the toothpick, then add the pom pom. 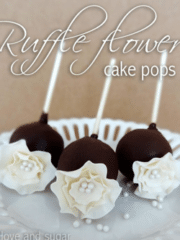 When the pom poms are ready, set them aside and ice your cake. 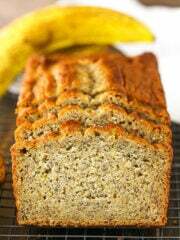 Once it’s iced and your edges are piped (I used Ateco tip 844. The Wilton 1M is similar), you’ll want to add the sprinkles to the sides of the cake. 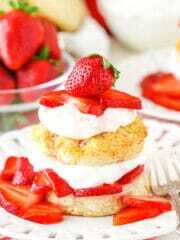 Do this immediately after icing the cake and before the buttercream crusts, or they won’t stick. I used a mix of silver and white sugar sprinkles, but feel free to use whatever color you like. Wilton makes quite a few options, and I found my silver ones in Publix. 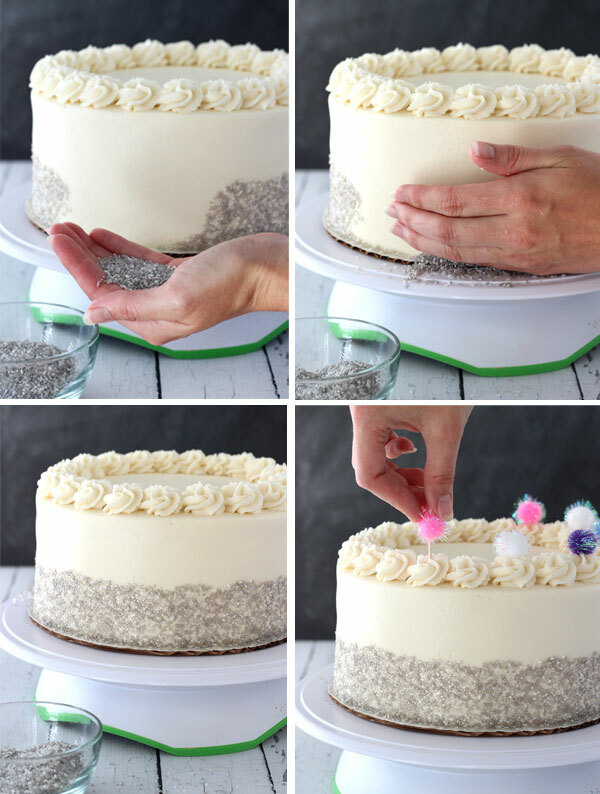 To get the sprinkles onto the sides of the cake, get a handful and hold them kind of where your fingers and palm come together, or more into your fingers. Do what feels comfortable, but that should give you a better angle. 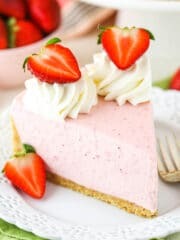 Get your pinky finger as close as you can to the cake without touching it and messing up the icing and lightly press the sprinkles against the cake, starting at the bottom and quickly working your way up. You may want to have a cookie sheet underneath the cake as you add the sprinkles so that it catches the ones that fall. Do this a couple times until it’s got the amount of sprinkles you want and filled in holes. After you’ve added all of your sprinkles, place the pom poms on the top of the cake, sticking them into the icing around the edges. I placed them in every other bit of icing to not overwhelm the cake, but you can add more if you like. I used a total of 10 pom poms. Top the cake with sparkly candles, if you’d like. I used candles that weren’t quite as sparkly as I’d have liked, but there are some good ones out there that’d be better. I’d guess Party City would have some good ones. And you’re done! See? Easy! And so darn cute! I want you to do more tutorials, Lindsay! That was great! And the cake is so festive. I’ve gotta get my glue gun out of storage! 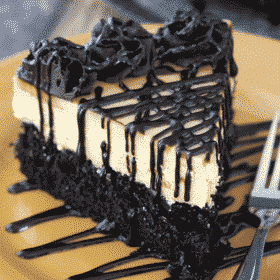 Hmmm, if the buttercream has crusted, it’s pretty hard. 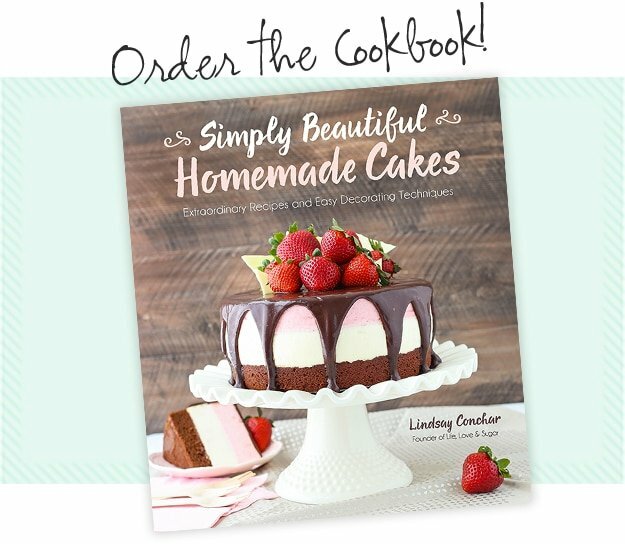 I haven’t tried it, but you could try moistening the cake – maybe with a spray bottle or something? It might make it sticky again. What a pretty cake. I love that you added some pompoms! Looks cute! Such a pretty cake! 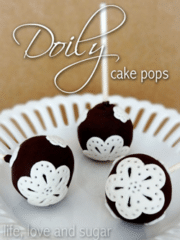 Love this idea of cake decorating tips – I NEVER would have thought of adding pom poms! 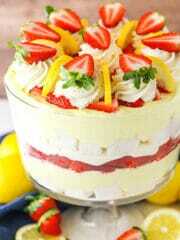 This cake is soo fun!!! I love it!